A former lychee orchard has converted into an excellent golf course. This resort style, flat course looks like one in Southern California and is also very challenging with strategically placed palm trees, bunkers, lakes and rivers. Water comes into play on 14 out of 18 holes. Given the Nicklaus designs’ tend to guard the greens closely with bunkers and water, you can only make a good score by hitting accurate approach shots to the greens. There are three 9 holes, A, B & C.
The B&C Course I played this time is much harder than A&B or C&A because A is shorter and has fewer water hazards. The facilities surrounding the course have a Thai or the South East Asian flavor, which makes you very comfortable. The best tee shot is to hit down the left side of the fairway in order to secure a good angle to the green protected by 3 bunkers to the left, right and behind. If you hit to the right side, the second shot becomes harder because the shot needs to carry over a lake and the deep right greenside bunker. The lake in front of the green makes this a difficult by visually appealing hole. A gentle dogleg to the right with trees and bushes on the left and a lake on the right. The fairway bunkers in the middle of the fairway are well positioned. You should avoid the deep bunkers guarding the left of the green . The approach shot into the green is slightly uphill. A beautiful hole. There is a split fairway with bunkers. You can have a better angle into the green from the right fairway on your second shot. Hitting the second shot for the left fairway makes the distance shorter but the shot requires you to hit over a big bunker on the front left of the green. A medium length par 3 with an island green. Needless to say a precise shot is required. I have played more than 10 Nicklaus designed courses this was the first to have an island green. There is OB and ponds on the left. You had bettr drive down the right side of the fairway in order to have the best angle into the green for the second shot. It becomes difficult if you hit the second from the left side of the fairway because your approach shot needs to fly over the pond and a 2-meter (7 ft.) deep bunker. A pretty par 3 over a big bunker with a good view. The tee is the highest on the course and the views of the rest of the course and of the neighboring town is superb. A river crosses in front of the slightly elevated green. You need to dive very hard to leave yourself with an easier approach shot to the green. A short par 5 with a green swung to the right. Long hitters can reach the green in two shots, but the front of the green is well guarded by a huge bunker, so one is faced with a tactical decision of whether to go for it on the second shot or lay up to the left short of the green The undulating green is double-tiered. It takes 2 hours and half from Hong Kong by club bus. All the staff including caddies were well trained and made us comfortable. This is a big resort with residential areas, a hotel, a swimming pool, tennis courts, a basketball court, a Massage & Spa Center, and even a children atelier room, etc. 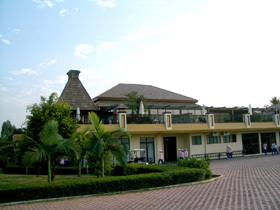 This was selected the best golf resort in China in 2001, 2002 and 2003 by China Golf Magazine. The restaurant has a pleasant atmosphere. Players who like to hit from the longest black tees need to bring single handicap certificates. The other Jack Nicklaus designed courses in China are Chung Shan Hot Spring (中山溫泉) GC - Jack Nicklaus Course, Pine Valley International (華彬國際) GC, Shanghai Links (上海林克司) G&CC, Hangzhou West Lake International (杭州西湖國際) G&CC, Spring City (春城) Ｇ＆ＬＲ - Mountain Course, Suzhou Sunrise (蘇州中興) GC, Nanhu (南湖) GCC, Mission Hills (觀瀾湖) GC - World Cup Course, Wuyi Fountain Palm (江門五邑蒲蔡) GC.